London, UK — Waste arising from households in the UK fell by 2 per cent between 2010 and 2012. Total waste generated by households fell by 2 per cent from 22.1 million tonnes in 2010 to 21.6 million tonnes in 2013. This amounted to 403 kg per person in 2013. The total weekly average household expenditure in the UK dropped by nearly 4 per cent in 2012 compared to 2010. These figures and many others can be found in the new „Digest of Waste and Resource Statistics – 2015 Edition“, edited by the Department for Environment, Food and Rural Affairs. 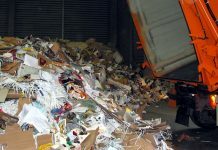 The digest is a compendium of statistics on a range of waste and resource areas, based on data published mainly by Defra, WRAP, the Environment Agency, Office for National Statistics and Eurostat. They are collated in this Digest for ease of use. The digest is aimed at a wide audience, including policymakers, analysts and specialists in the Defra Network, Environment Agency, WRAP, other organisations, the waste sector, academia, other researchers and consultancies. sector, figures on the repair, re-use and leasing sectors and data on employees in the waste sector. The digest can be downloaded under gov.uk.